This Cheesy Guacamole might be the best guacamole you’ll ever have. It’s chunky, perfect combination of flavors with some cheddar cheese thrown in, and super easy to make. It’s the perfect last-minute appetizer, ready in only 10 minutes. 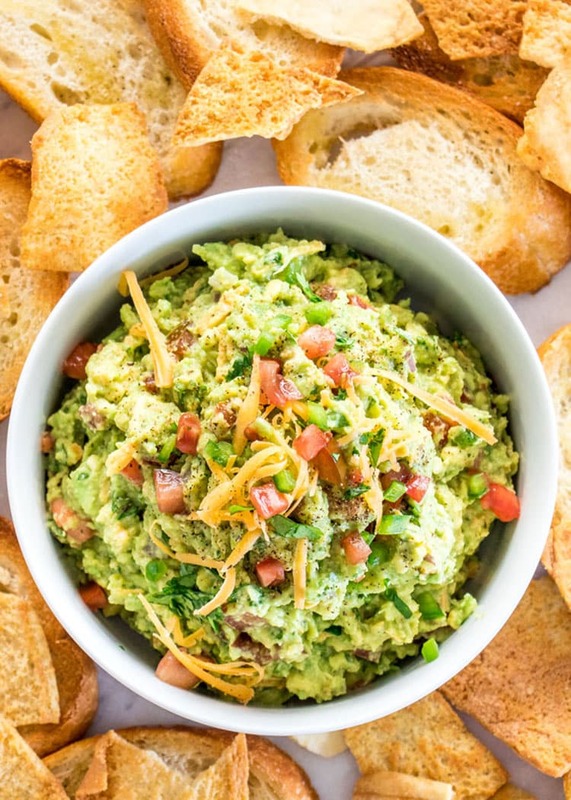 Guacamole is one of those dips that’s probably the most popular dip in the world. I know at my house we make it often because everyone absolutely loves it. 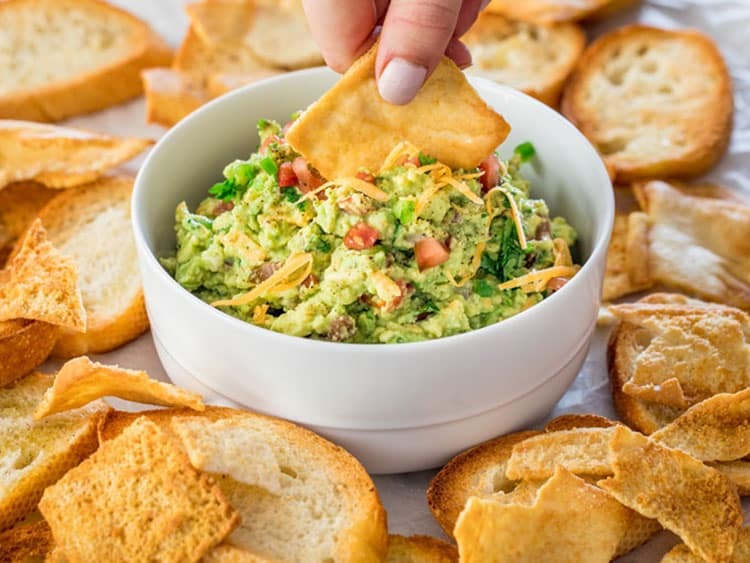 This recipe is my favorite for guacamole because it has cheese in it and in my book anytime you add cheese to anything, it will be delicious. While this may not be an authentic version, and trust me I don’t claim it to be, it is my version and I absolutely love it. 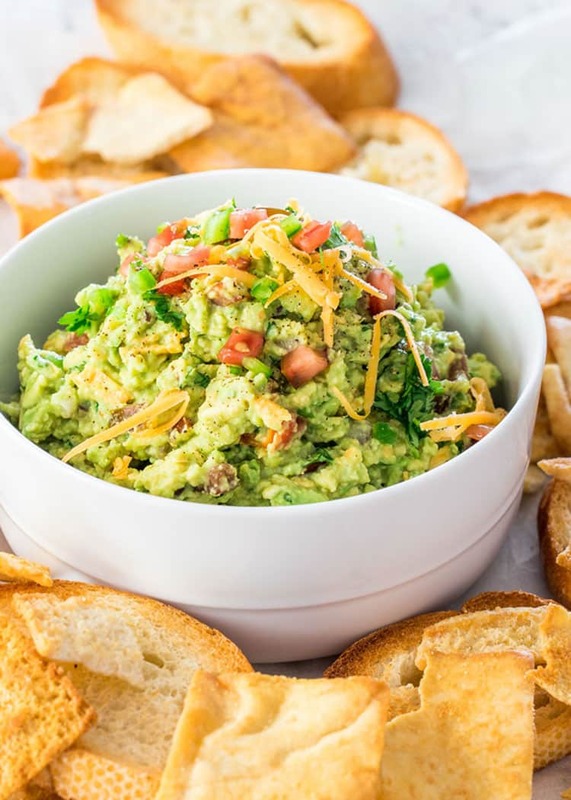 The great thing about guacamole is that it’s super quick to put together and it’s the ideal appetizer to make for when you’re in a rush. In less than 10 minutes you can have a delicious dip that is guaranteed to be a crowd pleaser. I love to serve this with pita chips, but I even love to serve it over crostini. I basically cut up a French baguette, lightly drizzle some olive oil over the slices, then season with salt and pepper. I put them on a baking sheet and under the broiler for about a minute per side. So good. Beats tortilla chips! This Cheesy Guacamole might be the best guacamole you'll ever have. It's chunky, perfect combination of flavors with some cheddar cheese thrown in, and super easy to make. It's the perfect last-minute appetizer, ready in only 10 minutes. 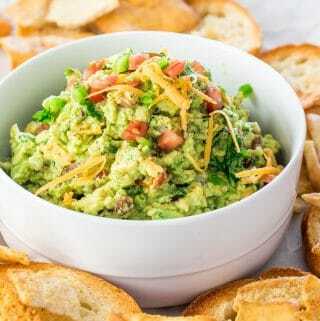 Add the chopped avocados to a medium size bowl and drizzle the lime juice over it. Lightly mash using a fork. Add the rest of the ingredients and stir well. Taste for seasoning and adjust with salt and pepper as needed. Chill until ready to serve. Serve with crackers, tortilla chips or pita chips. Guacamole should be made just before serving because the avocados will start to brown after about half hour even if lime is added to it. If needed to make a couple hours ahead, store it in an airtight container, first placing some plastic wrap over the guacamole directly on it, then close the lid and store it in the fridge till ready to serve.